With the 14th overall selection in the 1st Round of the 2018 NHL Draft, the Philadelphia Flyers selected left wing Joel Farabee from the U.S. National Development program. Just five picks later, the Flyers took center Jay O’Brien from Thayer Academy in Massachusetts with the 19th overall pick. Farabee has spent the past three seasons, playing 56 games, with the U.S. National Development program prior to committing to Boston University for the 2018-19 season. The six-foot tall, left-handed shooter amassed a total of 40 points (15G-25A) along with an impressive plus-26 rating in 26 games while playing in the USHL this past season. O’Brien, who will play for Providence College in the 2018-19 season, most recently averaged 2.67 points per game with Thayer Academy during the 2017-18 season. He finished the season with 43 goals in 30 games while tallying 80 points. Other prominent graduates of Thayer Academy include two former Philadelphia Flyers, Tony Amonte and Jeremy Roenick. The 2018 NHL Entry Draft will continue with Rounds 2 through 7 tomorrow beginning at 11 a.m. 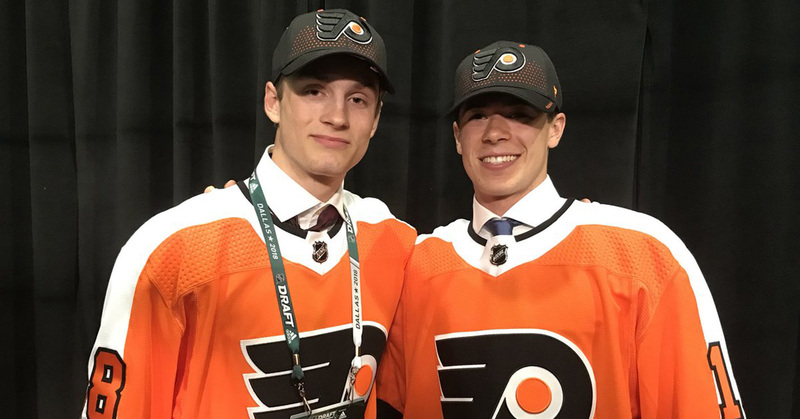 The Flyers have seven picks remaining in this year’s draft: 50th overall (Round 2), 112th overall (Round 4), 127th overall (Round 5), 143rd overall (Round 5), 174th (Round 6), 190th overall (Round 7) and 205th overall (Round 7).